I enjoyed this book much better than The Mage In Black! Don’t get me wrong, I enjoyed that book, too… but this one had more going for it. The team is on unfamiliar ground in N’Awlins and it’s always fun to put characters in a new situation. We inevitably meet some new characters, some of whom ingratiate themselves with the reader rather quickly and who I didn’t have a problem trusting, which is saying something. Lastly, we have a mission, which is two-fold: rescue Maisie and then find and kill the evil grandmother. I’ve rather been looking forward to that since reading book #1, so I’m happy that it’s now become a priority! So, the book opens with Team Awesome back in Los Angeles, preparing to kidnap one of the Dominae, which are essentially the three head vamps. Not Lavinia, Sabina’s grandmother and the Alpha Domina, but the weaker of the three. The kidnapping doesn’t quite go as planned but they grab their captive and flash on over to deliver her to the Faery Queen in hopes that an alliance can be made as well as to take instruction from Orpheus, the mage leader. Finally, Sabina, Adam and Giguhl end up in New Orleans to hunt for Maisie in order to rescue her, as well as Lavinia in order to kill her. Enter Zenobia, voodoo shop owner and friend of Rhea, and Zen’s assistant Brooks. I liked both of these characters immediately and found them both to be strong additions to the story. They were also infinitely helpful to the Team as well as colorful and fun to read. We also meet a few other new faces when Zen sends Sabina to a butcher shop to find a blood source and to a local drag club to find an information source. So yeah, Sabina’s at a disadvantage from the get-go. Still, she carries on and blunders about a bit, anxious to both find her sister and avoid the affections of Adam. At every turn, it seems that their enemy is one step ahead of them and that reacting is all the Team is capable of doing. Enter another new face, recreant mage and lead singer of rock band Necrospank 5000, Erron Zorn. His introduction is hilarious and really, I can’t do it justice here so I won’t even try. Suffice to say that he lends the team a hand and then later on, gives them some much-needed intel, info-dump style. I like this character a lot, though we don’t see much of him, sadly. I had a hard time putting this book down… or putting my laptop down, rather… and was anxious to get back to it and find out what was going to happen, already! I was happy with the way Wells handled Sabina’s growing up thing, it didn’t feel forced and it didn’t feel fake. It felt just right and though she still had a few temper issues and thinking she could handle things on her own issues, she’s matured as a character and it’s good to see. Had Sabina still been going on with her knee-jerk reactions from the first two books, there would have been much eye-rolling as I read. But she didn’t and there wasn’t. I feel that the pace of the story was good and there was enough humor to give me the occasional chuckle but not so much as to lessen the seriousness of the mission and the emotion of the story as the characters, namely Sabina, realized what was important to them and what they were willing to do to preserve it. 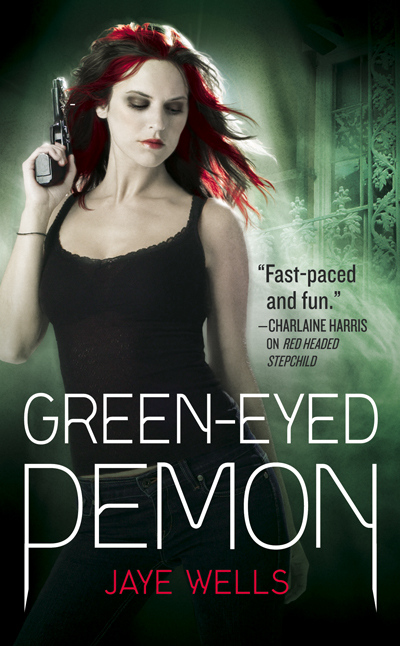 Bottom line, if you enjoy urban fantasy with punchy characters, I definitely recommend this series. Check the books out at Amazon.com, Audible.com or your fave local or internet book store. This entry was posted in 50 Books, review and tagged 50 Book Challenge, book reviews, fun, Jaye Wells, Sabina Kane, series, urban fantasy. Bookmark the permalink. The post also has links to her reviews for the first two books in this series… whatcha waitin’ for? Click-click!